Basement of Ghoulish Decadence: What's with all this Blair Witch Project talk again? What's with all this Blair Witch Project talk again? On July 30th, 1999, this small regional horror indie with an interesting concept opened to the festival circuit, quickly vanished, and finally debuted on video in the Haunted Horror Movies 50-Movie DVD Pack in 2005 that's now out-of-print. Well, that was probably what everyone involved figured the realistic outcome for The Blair Witch Project would be at the very start. Instead, the film weighed down countless moviehouse cash registers to maximum capacity worldwide and sold like toilet paper in the face of an apocalyptic three inch snowfall in its home state of Maryland. I can still remember first hearing of Blair Witch from a friend back when I was on my Internet AOL training wheels. He was convinced the whole thing was real while I used the common sense and knew there's no way the feds would just freely release any video evidence such as this. Poking around quickly revealed the events were indeed completely false, but that didn't stop the film from generating global coin (nearly) equaling the cost of one of Spielberg's summer homes. An interesting thing happened after the fervor. It seemed immediately after the theatrical and home video greenback explosion; most everyone that made it a mega hit decided Blair Witch actually sucked. The film's marketing which included faux documentaries and a wealth of official-looking case documentation on the film's official website was truly ingenious. The phenomenon was strong enough to sweep in huge crowds and make the film impervious for a time against negative water cooler chatter. Simply amazing for a horror film; let alone one with no names in front or behind the cameras shot Real World-style in hazy Hi-8 and B/W 16mm. All this and movie-goers were getting worn out on impossibly attractive rich white twenty five-something "teens" terrorized by boring kitchen knife-welding puppets. Revisiting the film last night due to its re-emergence with comparisons to Paranormal Activity; I can see why so many soured on Blair Witch. It's simply hard to criticize the film on conventional grounds. Usually, the director and/or writer can be blamed for boneheaded characters, decisions, or situations. The three leads and even the few interviewed townsfolk actors do a wonderful job of conveying the spontaneity of natural speech and body language. The choice and editing of the final cut footage is also impeccable. These were vital to pull off correctly and otherwise problems one has can't be really analyzed when reflecting on the concept's hook. The characters, decisions, and situations are just laid out in chronological for the viewer as supposedly "real" footage recovered from the group's recovered reels. The sense of realism is only heightened by the fashion the film underwent shooting. The actors were only given a treatment on the Blair Witch legend, essentially dropped in the woods, given near total control over the cameras, allowed to improvise all their lines, and were unaware of most of the supernatural events. I don't believe makers Daniel Myrick and Eduardo Sánchez purposely crept into this mindset for convenience, but this makes Blair Witch more prone to outright condemnation. This will be a stupidly precarious leap, but The Blair Witch Project can be liken in a vague shoestring way to Alain Resnais's overwhelming Nuit et brouillard (Night and Fog). Even though one is based in pure fiction and the other on the most savage act committed by mankind in the 20th century; each present their events in a plain matter-of-fact light. One can either love or hate the actual films, but that doesn't change the fact that it actually happened. 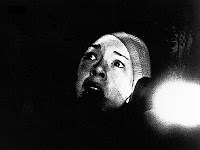 To reiterate, of course Blair Witch is entirely fake and nowhere of the same societal influence and value of Night and Fog, but within the confines of the horror genre, its audacious portrayal of "actual" events is just as polarizing and personally as hard to watch the Resnais masterpiece for their own unique reasons. Is The Blair Witch Project a genre masterpiece? Tough to say, it just seems "there", take it or leave it.